Ted Le Grice built the Piha Boarding House in about 1922, and it has long stood as a prominent landmark at Piha. So who was Ted le Grice and where did he come from? Charles Edward â€œTedâ€Â Le Grice was born in 1881 at Colville on the Coromandel, to Jeremiah Le Grice and Leah Le Grice, born Wood. Jeremiah was building the huge stamper batteries to crush quartz in the goldfields. TedÂ was one of the seven sons and five daughters born to the Le Grices. By 1905 the family was living at Tikinui in the Kaipara (south of Te Kopuru) where Ted was a millhand and most of his brothers were farmers. Ted married Lucy Murray in 1905. Lucy was the daughter of Sergeant Murray who had charge of the Tauranga Police Station. The couple lived at Orere Falls, Rotorua, where Ted was listed as a photographer. The Rotorua Museum holds a large collection of Tedâ€™s photos, made for the tourist trade: photos of geysers shooting to a great height, famous Maori guides, blanket-draped Maori mothers boiling dinner in hot springs, Maori children diving for pennies and the lovely Government Bathhouse and gardens. These were printed as hand-coloured postcards and would have made a steady trade. Ted and Lucy had three children: Edward Murray born 1907, and the twins, Lucy and Charles, born in 1912. Something went terribly wrong at this birth as Charles died, and his mother also died, leaving Ted with a newborn and a five-year-old son. Ted married again in 1914 to Frances Christina Murray, Lucyâ€™s older sister. She had stepped in to care for her sisterâ€™s children and marriage ensued, a not unusual sequence of events at that time. Ted and Frances had one child, Joy, born in 1915. By 1919 the Le Grices were living in Moana Ave, Onehunga, and Ted was an engineer, though they soon moved to a more salubrious address, 14 Sarsfield Street, Herne Bay. Francis Christina died in 1922, when Joy was only seven. In 1924 Ted married for the third time, to Jessie McBain, a 44-year-old spinster. 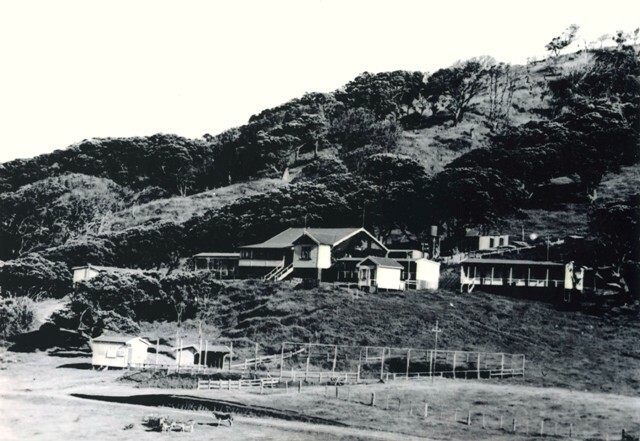 Around the same time â€“ 1922-23 â€“ Ted bought about 68 acres at Piha from Dr Frederick Rayner, to build a boarding house. He chose as the location a natural platform above the flat area that became the Piha Domain with a wide southern view over the Piha Lagoon to Lion Rock and Taitomo Island. The land encompassed the hillside behind the building platform, up behind todayâ€™s Garden Road. He also bought the abandoned Piha Mill building, enabling him to use the huge kauri planks to build the boarding house, which he did himself with help from his brother Lawrence. The land had been recently cleared so that cattle could be run to feed the men at the Piha Mill, but the pohutukawa had been left, so the boarding house was nicely framed with ancient trees. There was a central block containing the kitchen, sitting rooms, dining room and enclosed verandah, and outbuildings with cabins and bathrooms for guests. There was not much going on a Piha in the early 1920s: the Mill had closed and in about 1925 a subdivision by Richard Kibblewhite sold a few sections then failed. It was hard to get into Piha because there was no good road down the hill, and, in the early years, only Ted Le Grice and a few others could get their cars down â€“ Ted would often back his car up to the hill to get out. Getting out of Piha with the car was a two-day exercise. On day one, Ted would take his car up the hill, the difficult part being taking it below the big rocky bluff (located at 36 Piha Road). At the top of the hill, Ted would park his car and then borrow one of Ussherâ€™s horses and ride back down to the boarding house for the night. Next morning, he would ride back up, return the horse to the Usshers, and take the car on the next leg to town. Visitors to the boarding house were either brought out in Tedâ€™s car from Glen Eden rail station, or they walked from Nihotupu, or occasionally along the coast from the wharf at Whatipu. The tariff in 1927 was 10/- a day or three quineas a week. Despite the access difficulties, the boarding house had a good trade, as it was popular for artists and excursioners to take the air on the coast, paint, wander on the beach, and trek in the bush in between meals servedÂ in the dining room with silver service on long tables dressed withÂ white table clothes. Hard work for Jessie Le Grice and her helpers, as sheets and table clothes had to be washed with copper and wringer, and there were no shops nearby to purchase provisions. These had to be grown and hand-made, and there were 48 cows to be milked twice a day. Ted kept a big vegetable garden, and killed cattle for the table. A good shot, he and his youngest son also hunted for wild pigs, and schnapper caught off the rocks or mullet caught by netting in the bay, also ended up on the table. Ted and Jessie had one child, Ian James, born in 1927. There was a school for the Le Grice, Ussher and Mobbs children, located in a tiny bach owned by Ted Le Grice on Piha beach, but when the teacher Mr Greinhow left in 1927, 15-year-old Lucy Le Grice took over the task. Ted Le Grice was a hard working man by all accounts, and had many irons in the fire. He ran a land agency and also in the early years, a bus company in Otahuhu. At Piha, a dance hall was erected for guests and a post office opened where guests could send and receive mail. With the Mobbs he got the telephone brought to Piha, dragging the lines through the bush. The bells for the phone rang in the boarding house and someone would rush out to answer the phone. A small store was erected at the bottom of the drive by the campground and this sold sweets and drinks to visitors in the weekend, and once â€œMacâ€ Macfarlane started a bus service, he would bring out a can of icecream which would stay cold enough to get through the weekend. The tennis court (where the cafÃ© is today) was hand dug by Ted and Ian, leveling it and cutting into the bank behind, before grass was laid. In 1936, Ted and Stella Browne took over the lease of the boarding house and in 1942 the Pople family purchased it. When the Brownes took over, Ted built a house along Garden Road and then in 1942 the Le Grices went to Orua Bay, Awhitu, where they had a farm and hotel for four years. Later Ted and Jessie went to live in Alfriston Road, Manurewa, and then Calliope Road, Devonport. Jessie died in 1958 and Ted the following year. There are a number of Tedâ€™s photos in public collections but nothing is known of a whole box of Piha photos that was lent to someone at the university and cannot be traced. With Tedâ€™s undoubted skills we would be much the richer if we had the full range of photos Ted must have taken.